Del Lago Golf Club is located in Vail Arizona is a community southeast of Tucson. Del Lago Golf Club is Rancho Del Lago. Rancho Del Lago is a master planned community in Vail which has found its calling and growing rapidly. Del Lago Golf Club serves as the center piece of Rancho del Lago about 20 minutes from downtown Tucson off Interstate 10. Del Lago Golf Courses provide golfers a selection of golfing challenges and views. Golfers greatly appreciate the natural beauty of a high course that rests at an elevation of 3,400 feet – five degrees cooler than Tucson during the summer. Del Lago Golf Club invites all golfers to come and play the course. Built by Nugent Golf Associates, the same firm that produced the Tour stop Kemper Lakes del Lago is a great golf course. Del Lago Golf Course has an elevation change of over 120 feet during play. Del Lago Golf club’s 1st hole begins at the highest point on the course. Play then continues down into the valley. Del Lago Golf Club’s back nine, which runs along Pantano Wash. The course winds its way through the hills and valleys of the high desert. 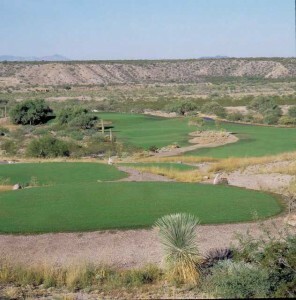 Players will also enjoy spectacular and unique views of the backside of the Rincon Mountains and the Santa Catalinas. The first hole at Del Lago Golf Club requires a bit of carry when hitting from the back tees. So bring “the big dog” to the course. Overall, Del Lago Golf Course is golfer-friendly off the tees. More skilled players may play the back tees, which at 7,206 yards, carry a rating of 73.9 and a slope of 135. Par is 72. Questions about the Tucson Real Estate Market, Tucson Homes or Del Lago Golf Homes for Sale? Call Us 866 316 5575 OR complete the CONTACT FORM and we will get right back to you!